Cards: Fleer Ultra 1993, Fleer Ultra 1991, Action Packed Rookies 1992, ProSet 1991. Acquired: Canton Acquisition 2012, TTM 2014, C/o Home. 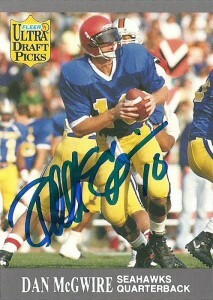 Dan McGwire was rumored to be the top pick of the Patriots in the 1991 NFL draft, with ProSet even going so far as to making a test card of him. 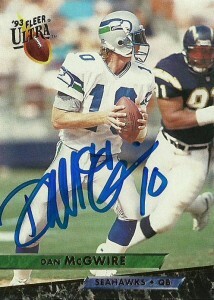 Instead he slid all the way to the Seahawks at 17, who were trying to end the Dave Krieg era in Seattle. 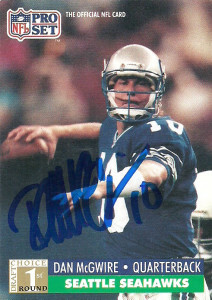 He’d be the first of many quarterbacks that the team employed behind the depleted offensive line over a very short period. 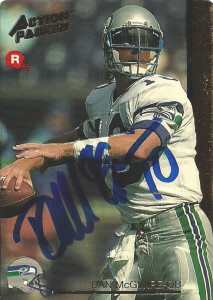 I sent out 4 cards to Dan, but he only signed his Seahawk cards, skipping out on his Upper Deck 1991 Star Rookie issue and his 1991 Star Pics. Both were of him in his Aztecs uniform, but still I was happy to get him on his Action Packed card that I had wanted to get autographed since it was issued. These others here came to me care of a collector who was exiting the market for a while. I really like the Topps Stadium Club entry. It’s a very nice action shot from the line of sight of a receiver. The others- particularly the Fleer Ultras were absolute throwaways both in photo and in set.